Every day the world sees1 million new blog posts, tens of millionsof tweets, hundreds of millions of newpieces of Facebook content, and morethan 1 billion YouTube videos. In our age of information saturation, consumerattention is the scarcest commodityof all—which makes your job tougher than ever.How do you thread your messages throughbillions of bite-sized information snapshots toreach the right people? One thing’s for sure,you’re not going to succeed using traditionalapproaches. Mass marketing is dead; the nextbig thing is indeed very small. microMARKETING empowers you to rethink,retool, and revitalize your marketing strategiesto take full advantage of the opportunities createdby the microcontent explosion. A pioneerin the world of microcontent marketing, GregVerdino helps you create a strategy thatemphasizes relationships over reach, interactionover interruption, and social networkingover broadcast networks. How do I earn the attention of the rightinfluencers and my core customers? How do I really build my brand one blogpost, one video clip, or even one tweetat a time? How do I achieve massive scale whenmainstream media is losing ground toconsumer content creators and peer-to-peer distribution? How do I strike a balance betweentapping into today’s biggest marketingtrends without losing sight of the littlethings that matter? When one door closes, another opens. Massmarketing is no longer a viable marketing strategyand, likely, never will be again. 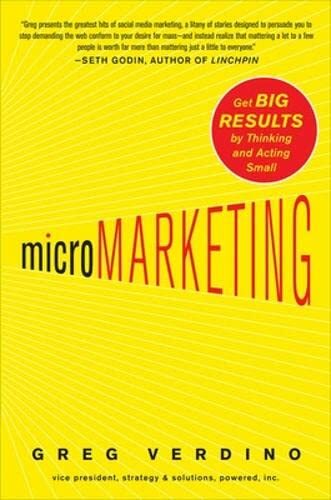 Micromarketing,though, enables you to resonate with consumersin compelling new ways and achievethe big results that no longer seem possiblewith traditional approaches. It’s time to start building your brand, findingnew customers, establishing relationships, andgetting real results on this exciting new frontier.microMARKETING will show you the way. Greg Verdino is vice president of strategyand solutions at Powered, Inc., a full-servicesocial media agency. He has 20 yearsof experience in marketing and related fieldsand has advised such clients as American Airlines,American Express, Coca-Cola, Ford, andPanasonic. Verdino has been profiled in andquoted by many business and news media, includingAdvertising Age, Adweek, Forbes, TheNew York Times, and The Wall Street Journal.He lives in Huntington, NY.